Economically the peach is ranked third of the deciduous tree fruits behind the apple and the pear. Peaches originated in China, and they set between December and mid-March. Not all the peaches listed below are heritage varieties. A number of modern dwarf cultivars are both ornamental and producers of good fruit. These include ‘Bonanza’, ‘Rose Chifffon’ and ‘Snow Ballet’. Note: Peaches set between December and mid-March. 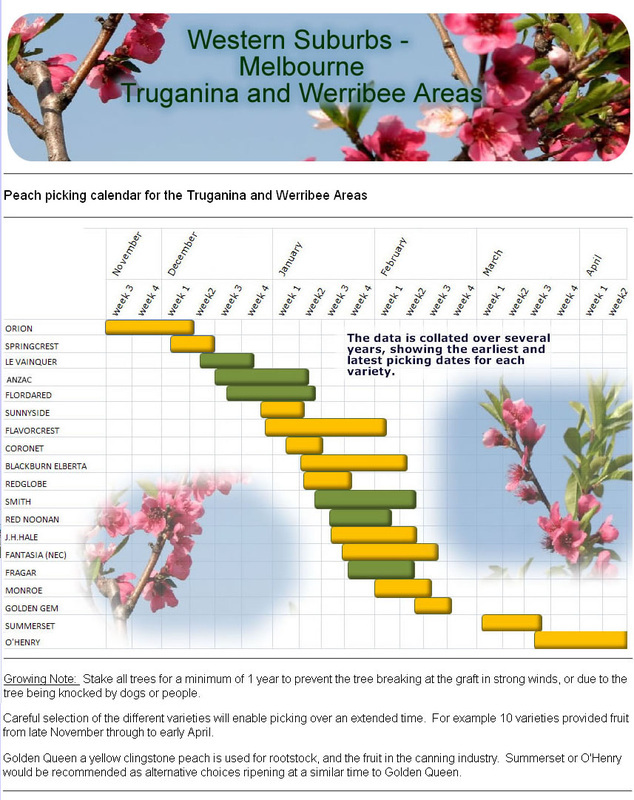 Many heritage peach varieties are available from Pete the Permie, Mt Alexander Fruit Gardens, in Harcourt, Central Victoria; Yalca Fruit Trees; CERES Nursery; Daley’s Nursery in NSW; Thistlebrook in Queensland and Fruit Trees Australia. Fruit descriptions are from these nurseries. The Angel Peach is a new form of peach, which has doughnut shaped fruit. It is a very sweet white fleshed variety, which is more soft and juicy in texture compared with standard peaches. Performs best in temperate climates. The Angel Peach is a new form of peach, which has doughnut shaped fruit. It is a very sweet yellow fleshed variety, which is more soft and juicy in texture compared with standard peaches. Will crop in warm subtropical climates. Requires approximately 150 hours chill. Suitable from Rockhampton south to the subtropics and coastal NSW. Old fashioned white flesh peach, very juicy with good flavour. Aztec Gold has a yellow flesh and requires up to 300 hours of chill. It has a good resistance to bacterial black spot. A large firm fleshed peach that grows well in the subtropics. Resistant to bacterial black spot. Aztec Gold has yellow flesh and red / yellow skin. Ripening in the first week of the year, fruit cream and red skinned, white juicy flesh, very good cropper, precocious (potentially a decent crop in the second year, with the proper cultural conditions), fruit gradually ripens over a number of weeks, not coming all at once. Old variety, freestone, rich yellow flesh, sweet and juicy. One of the best early peach varieties. China Flat is a white-fleshed variety needing 150 hours chill. A freestone heirloom variety that is flat in shape, pale in colour and with a delicious taste. Firm flesh. The Coronet peach has medium to large yellow fleshed fruit. It has a quite sweet flavour. Coronet peach is a free stone and is ideally used for fresh fruit, canning, stewing, baking and jam. It is quite a heavy cropperm and self-pollinating. Fruit ripens from late December onwards. Trees grow approximately 4m x 4m. The Elberta Peach tree is the best known yellow canning peach. It is a freestone peach variety and has very large fruit. The skin is red blushed over a deep golden yellow colour. This variety has a wonderfully sweet flavour, one of the sweetest peaches you will ever eat. Ideal for eating, juice, drying, stewing and canning. A mid to late season variety. Trees grow to approximately 4 x 4 metres. Medium to large, reddish skin over yellow background. Yellow-fleshed peach, not very hairy. Freestone, good flavour, quite sweet. Prone to splitstone under drought conditions. Semi freestone, average shape, medium size. Very attractive bright yellow with up to 60% red blush in warmer areas. Very firm, good flavour, moderately resistant to bacterial spot. Heritage white flesh peach, pink to red skin over a greeny cream background. Flesh is softer and coarser than Tasty Zee, but with more complex flavour. Well known heritage variety of clingstone from New Zealand. Medium sized fruit, deep orange skin and firm deep orange flesh. Sweet, excellent for bottling. Origin: J.H. Hale is an old-time heirloom variety. J.H. Hale Orchards began in Glastenbury, Connecticutt in 1866, when John Howard Hale and his brother, George, cultivated their grandfather’s seven peach trees. Description: A very large, round peach with yellow skin and red overlay and very little fuzz. Yellow flesh with a firm texture. A freestone peach. Flavour: It has a wonderfully sweet taste and aroma, and is an excellent peach for eating and canning. Matures mid to late Febraury making it a late season variety. JH Hale is not fully self fertile – it benefits from cross pollination by an Elberta peach. Trees grow approximately 4 x 4 metres. A late bearing variety with delicious firm flesh. The fruit lacks a dark red blush that has limited its commercial acceptability. Low chill requirements of 15 hours. Prunus persica ‘O’Henry’ is a very popular old-fashioned free-stone peach with red skin and yellow flesh. It is incredibly tasty and juicy and is similar to the yellow-skinned variety ‘Million Dollar’, now known as ‘JH Hale’. The main difference between them is that ‘JH Hale’ needs a pollinator, while all other peaches and nectarines are self-fertile. Large, red blush over dark yellow ground colour. Tough skin, rich yellow flesh. Very sweet, aromatic. Freestone. Lends itself to poaching and other rich peach desserts. Low chill peach rootstock used for grafting subtropical peach and plums onto. Has a degree of nematode resistence. Origin: Introduced in 1940 by Dr. Stanley Johnston of Michigan State University, who helped revolutionise modern peach breeding. Description: The fruit is round, and medium to large sized. Flesh is yellow, skin has a dark red blush on exposed areas over a yellow background. A freestone variety. Flavour: Moderately juicy with very good flavour. Redhaven peach trees are quite heavy when cropping, some thinning may be beneficial. The fruit is ideal for eating fresh, drying or stewing. The fruit ripens from early to late January making it a mid season variety. A must-have for any backyard orchard. Trees grow approximately 4 x 4 metres. Yellow flesh, medium to large peach, mostly red skin with yellow background. Good flavour, sweet and slightly acid. Freestone. High density flowering, double pink peach blossom in spring with a white flesh full sized peach, freestone. Often ripening just in time for Christmas. No pollination required. Great for warmer climates with only 300 chill hours required. Yellow-fleshed peach. Another in the series of clingstones developed at Tatura in Victoria in the 1980s. Very similar to T204 but more prolific bearer and slightly darker skin. Best to pick clingstones for bottling when just yellow and quite firm (though not too green or they won’t be sweet enough). Yellow-fleshed peach, clingstone, very similar to Golden Queen, but tends to be slightly smaller fruit. Very sweet, excellent for bottling. Yellow fleshed variety needing only 150 hours chill. A semi-clingstone peach with round, large size and very good skin colour. Very firm with excellent flavour. One of the best subtropical peach selections. White, non browning fleshed variety requiring only 225 hours chill. A freestone peach with round, medium to large, creamy white skin and outstanding flavour. Highly resistant to bacterial spot. Ripens early November. “We are happy to learn that some successful experiments have been this year made in expressing cyder from the peach, in such quantities as to promise real advantage. Several of the settlers at Kissing Point have devoted much attention to the praise-worthy object; one of whom informs us, that he has already put up about 200 gallons; which with a few months fermentation, he doubts not will be found equal to the apple-cyder in strength, and not inferior to the taste. To effect this, however, his labour has been prodigious, owing to the mode in which, for want of a press, he was obliged to extract the juice. To this end he had recourse to every inventive faculty; and first, to separate the fruit from the kernel, hewed the but of a tree out in shape of a mortar, wherein he readily accomplished this part of the task; then smoothing off the flat side of another tree, which he designed using as a part of the press, prepared a substantial board as its opposite ; and against this raising the best purchase he could, a tolerable portion of the juice was extracted, which ran into vessels set purposely to receive it. He had the last year commenced the operation, but merely by way of experiment, and upon a very small scale ; the produce of which, bottled off, attained to so much excellence in the course of six or seven months, as to determine him to extend his plan.